The promotion of our university is continued with a visit to high schools in Smederevo: Technical, Agricultural and Economic-Commercial. The promotional team was composed of prof. Vojkan Zorić, PhD from the Faculty of Civil Aviation, doc. dr Momcilo Jokic from the Faculty of Culture and Media, doc. dr Slobodan Petrovic from the Faculty of Law and assistant Milena Bokić, PhD student at the Faculty of Business Studies. 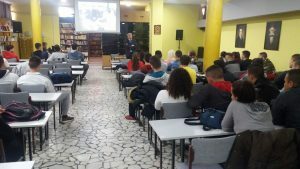 A warm welcome was hosted by Brance Stojanovic and Dragan Stojnic from the City Administration in Smederevo, directors of the aforementioned schools with their teams, and student of the Faculty of Culture and Media, Miljan Guberinic, who was a guide and moderator. Hundreds of students of the final years followed with attention the lectures of visiting professors. 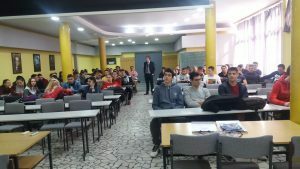 Special interest was expressed by the students for the offered free scholarship for the 2nd and 4th year of the undergraduate business studies, as well as for studies abroad through “Erasmus” and “Ermus +” program.